Apply the latest upcycle fashion ingenuity to upcycle your tired old clothes and charity shop finds into trendy new threads! 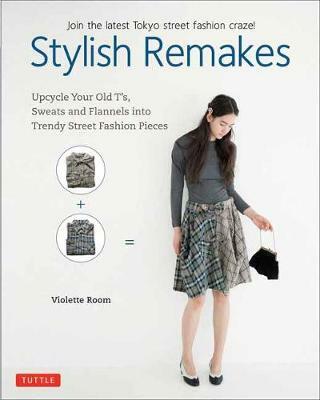 Stylish Remakes shows you how to give new attitude to the stuff you have had in your wardrobe for years. And it's so easy! With just a little time cutting and sewing you can create fun and funky new pieces from old flannel shirts, tees, sweats, bandanas and more. It's inexpensive (often practically free!) and fun to do. And it's completely up to you to create your own personal fashion style! Salvage old duds and morph them into something completely new with this easy-to-follow upcycle sewing book: Add a fun and fancy bow or collar to your favorite tee or sweatshirt Make a dress or bag from a handful of old bandana scarves Combine a skirt and top to create a unique new dress or tunic Craft a fashionable new skirt or dress from a pair of old flannel shirts Tie ruffles and bows to feminize a man's shirt Embellish your favorite tees, sweats, and other odd bits-and-pieces to create one-of-a kind creations You can do all this with no previous sewing experience and a minimum of time and fuss. Anyone can do it, and anyone can wear it. Just open this book and grab some old classic duds from your drawers. Then create your own personal fashion style!